Unlike some of our readers who may not have been born yet, I was a regular in the comic book stores in 1992 when DC pulled the ultimate publicity stunt and killed off the Man of Steel. His death in Superman #75 sold 3 million copies. It was a perfect storm. You had regular comic readers interested. Former comic readers interested. Non-comic readers. The young and old. Fans of the Superman movies or various TV shows. Everyone was talking about it. It was during a time when the death of a character seemed to actually mean something and didn’t happen every other day. Especially to such an iconic character. Sales were also boosted by occuring during the comic market boom as people were buying multiple copies as investments, hoping to cash in down the line. Especially the variant black polybagged version which featured the logo above. “Fans” were buying two copies. One to open and read and one to lock away in a pressure sealed vault for safe keeping. As we know, the market boom crashed not long after and this issue has often been attributed as having a major role in that. But that’s a different column. We’re here today to talk about the potential latest death of Superman. 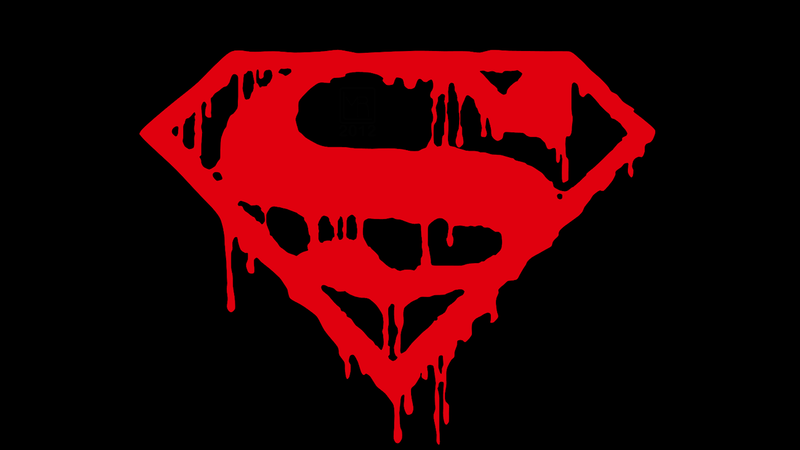 More (including spoilers) after the break on the ongoing Final Days of Superman storyline in Superman #51, Batman/Superman #31 and Action Comics #51. A funny thing happened yesterday when I went to the spinner rack to pick up my comics for the week. For the first time in a long time I had no DC issues in my pull list. I’ve always read more Marvel than DC, but there was usually at least one DC book springled in the mix. Especially when weekly books like Batman And Robin Eternal were being publish. Even in a slow DC week, I could count on those. In trolling the interwebs I stumbled upon a story about the current Final Days Of Superman storyline by Peter Tomasi. An eight part story that will finish up Superman, Action Comics, Batman/Superman and Superman/Wonder Woman heading into DC Rebirth. The story is pretty simple. Superman is dying because of some form of “super cancer” and goes about setting his affairs in order. Actually sounds very All-Star Superman by Grant Morrison to me, which had a similar concept. But if that is the case, could they actually kill off the New 52 Superman in a meaningful way? The other rumor coming out of DC Rebirth is that there will be a Superman and a Clark Kent who are not one and the same. Perhaps the New 52 Superman will simply be depowered and continue on in Rebirth as Clark while Pre-Flashpoint Superman will take over as the main Superman without the burdens of this secret identity. In either case, I found myself surprisingly intrigued. So I picked up the first three chapters of the story. I mentioned All-Star Superman above. The beginning of this issue really gave off that same vibe. Even the artwork made me think of it. Outside of that, not a lot seems to happen here. We’re given the news “I’m dying” on page one, straight from the horses mouth and after Superman plows through the stages of grief in record time it’s on to setting his affairs in order including chats with Lana Lang and Lois Lane. The book feels incredibly short, likely due to the abundance of splash pages and two page spreads with limited dialogue. Having not been a regular reader of Superman I did feel a little confused at times especially about a sub-plot that sees a second Superman make an appearance. Who is this? Is it a new mystery or something that people picking up Superman each month are familiar with? And what exactly is going on in China? You know what I do if I’m dying and Batman offers to help save me? I LET BATMAN TRY TO SAVE ME! HE’S THE GODDAMN BATMAN! The “second Superman” sub-plot continues and he seems to be bi-polar or have a split personality or something. The China subplot also continues as a horde of demons speaking Mandarin show up and attack our heroes, eventually killing themselves so they do not reveal who sent them. Except one, that gets away after slashing Superman’s neck and drawing blood. This issue doesn’t feel as short as Superman 51, but does get a bit splash page happy near the end. This issue is actually dominated by the ongoing sub-plots. Bi-polar Superman shows up at the Daily Planet in his street clothes. Believing he is Clark Kent he kills anyone that opposes him since he obviously doesn’t look like Clark. He is eventually stopped by a couple of tasers courtesy of, who else, Lois Lane. Meanwhile, in China, the demon that slashed Superman in Part 2 drops his claw off to a doctor in a lab. The claw contains a large Kryptonian blood sample. Who is this Doctor Omen? What is she doing with Superman’s blood? 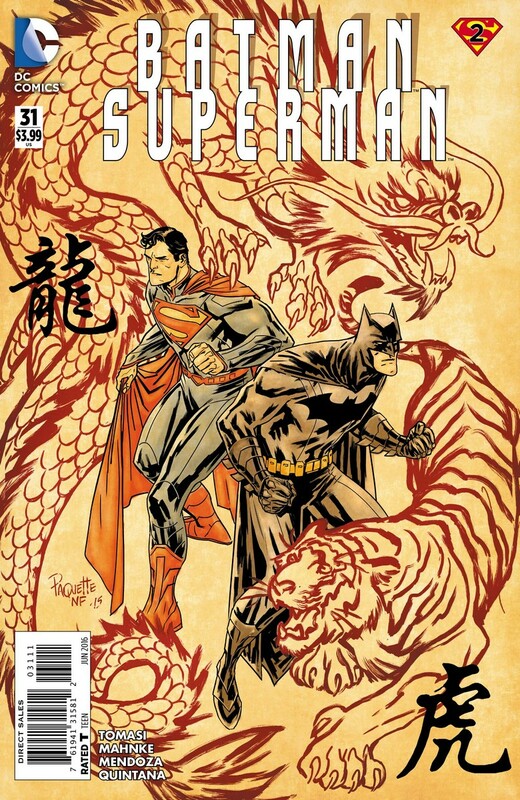 And is any of this tied into the new Chinese Super-Man (don’t forget the hyphen!) that is set to debut in Rebirth. It all seems much to coincidental not to be related. As for Superman, with Batman’s help he’s tracked down Supergirl. He informs her of his condition and passes the mantle of being the greatest of the House of El over to her. Then he literally gives her the keys to the Fortress of Solitude. And have you ever had some big news and your significant other found out before you were able to tell them and they were super pissed with you? Well, Wonder Woman arrives as Superman’s door and somehow knows he is dying and she is not happy with him. And that is all that has been released so far. Part 4 arrives next week in Superman/Wonder Woman #28 and then the story concludes with another run through the same four titles before DC Rebirth hits on May 25th. Time will tell if this has been a worthwhile pick up. It has been a bit underwhelming so far, but is interesting enough to see it through. Look up a Superman foe named “Kancer” when you get the chance.